Can you imagine that you can now plug your LCD display through USB port and yet maintaining 1600 X 1200 display resolution? Normally the LCD display interface is connected to DVI or VGA video card and even if connected to USB port, there is a huge limitation of refresh rate and poor video quality. 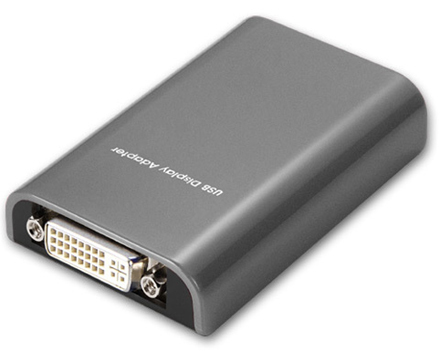 But now there is a quick and effective way to connect through a USB to DVI display adapter with the introduction of new USB to DVI adapter by Sewell. It is mainly targeted for those that would like to run a few display monitors simultaneously with the rich USB ports. Amazingly, the tiny adapter is capable of supporting high resolution of display up to 1600 X 1200 pixies while still maintaining a good refresh rate just like traditional video card. The mini adapter is equipped by 256MB RAM memory and has able to accelerate the performance much higher than its previous competitors’ product. The allocated RAM space is more than sufficient to serve the video stream that eventually able to offload activities from CPU to perform other tasks. Meanwhile, USB throughput of 480 Mbps will no longer limit the overall performance and even on par with existing standard video card. Priced at $150, it is available in commercial market now. It does come with entry level version with lower resolution at cheaper price. Good thing is, it is compatible with Windows 2000, XP and even Vista. I am curious and hoping to get one just to try out with multiple LCD screens connected with single PC concurrently.